CCS STUDENT ELECTED PRESIDENT OF ISSU. 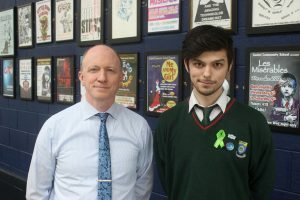 Congratulations to Leon Egan, 6thYear student in Cashel Community School, on being elected President of the Irish Second-Level Students Union. Leon, pictured here with Mr. John Murray (Deputy Principal CCS), is looking forward to his year in office.